Turn a plain cheesecake into an epic symphony of sophistication with this No Bake Lilac Blueberry Cheesecake. Lilac? Oh yes! It is subtle, wonderful and makes the cake an eternal spring classic! A decade, a freaking decade people! Double digits! I am honestly a bit at a loss for words. Suddenly my blog feels like a child. 10 years is a long time to nurture such a project. And, like a child, I have seen it grown, I have seen it crawl, take its first steps and later on some leaps. I have seen it sing, kick and scream, smile ear to ear, and shed tears. It has laughed a lot and loved. So much love. Love from me to you and enormous portions of love from you to me. 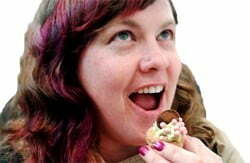 Please help yourselves to a slice of my Lilac Blueberry Cheesecake and come celebrate my 10th blog anniversary with me! I simply could not have done it without you, you and you. I send you all a heartfelt thank you – my family, friends, coworkers, and my online friends/fellow blogger community. Of course I do this blog for myself first, it is a hobby passion I do outside of a full time job, but you are the oxygen that keeps it alive with your feedback and encouragements. I cannot express enough my gratitude for your visits to my site and every comment that you leave. Thank you! At the end of 2016 I felt like I was straying slowly from my goal. 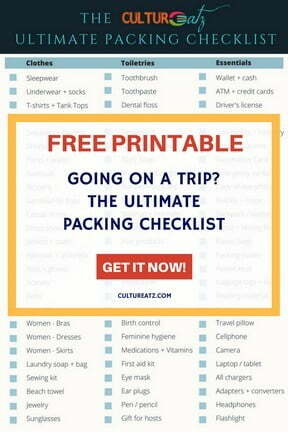 I was not making as many culturally challenging recipes or sourcing unusual ingredients. So with the new year, in January I committed to get back to my roots. Almost every recipe since 2017 has been focused on exploring various countries further and trying new things. making homemade green almond liqueur after tasting a similar liqueur I had in Austria last summer. attempting Chinese hand pulled noodles (lamian), not once but twice! A challenge I am still working on. playing with unusual ingredients like these pancakes made with cattail flour. the amazing Ashe Anar, a Iranian and Iraqi Pomegranate Soup with lamb meatballs. diving into the world of sourdough starters and sourdough breads! It’s been slow going but I have a new project (did you notice it is up in my menu bar?) called Eat The World. I wrote down every country on the planet and I hope to prepare a recipe from each one. Right now it is a question of going through 10 years of posts to link up the countries I have already done. Check it out and follow along. It took me a while to settle on a recipe for this momentous occasion. How do you even pick a recipe for that? Something that says celebration, something sweet, something fun…and of course to make it really ME, there has got to be an UNUSUAL element to it. The last two weeks of May are two of my favorites weeks of the year because lilacs are in bloom. I adore the smell of lilacs. I stop at every tree and sniff it like I am trying to get high! Could I turn this recipe into a Lilac Blueberry Cheesecake? 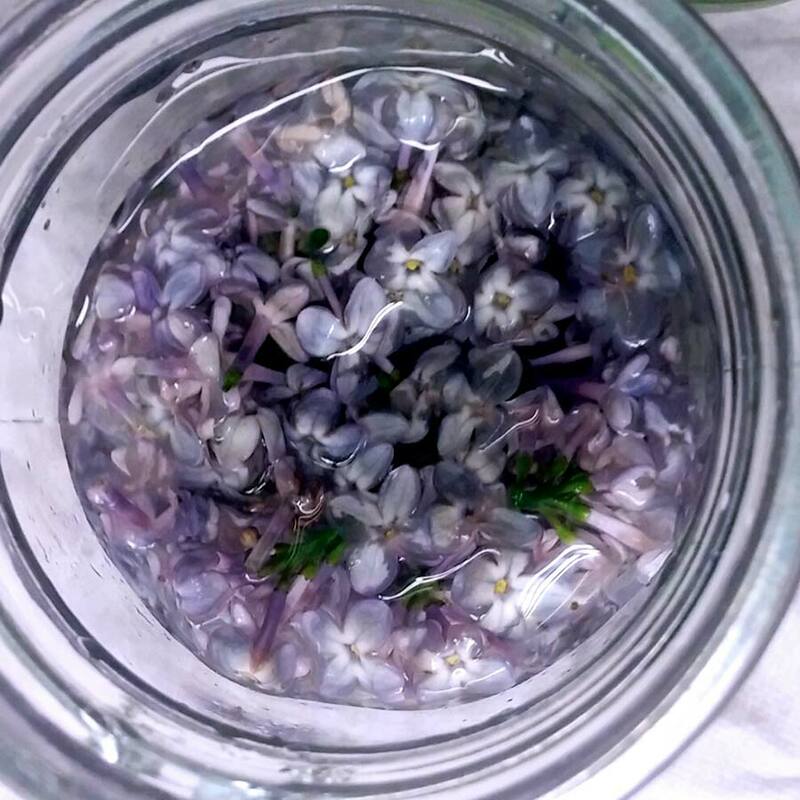 Since I am a big fan of tinctures (I wrote a post on how to make tinctures) I decided to see what would happen if I tossed a small bouquet of lilac flowers in vodka. Well a drop of this vodka on your tongue literally taste like a whiff of the flowers. Now I can have a lilac sniff anytime I want. My lilac extract was ready just in time for this 10th blogiversary post. 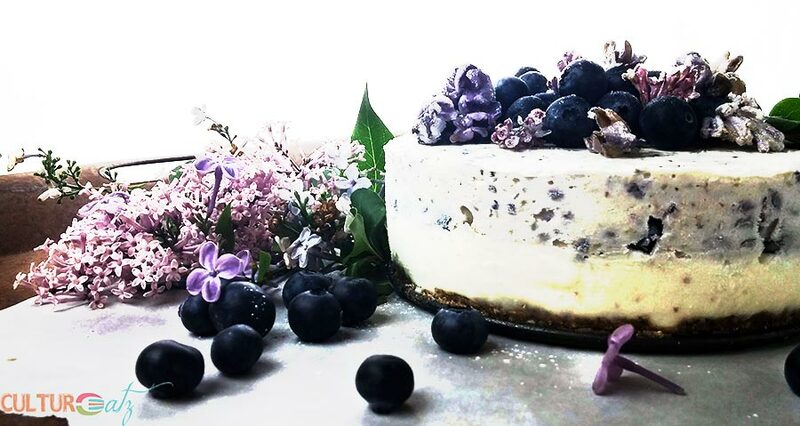 Not only is this Lilac Blueberry Cheesecake sublime for a celebration, I also found a way to capture spring eternal as well. 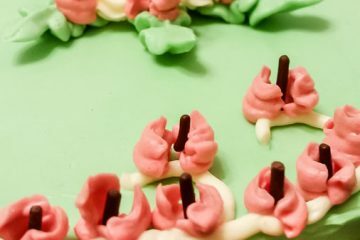 I even went so far as to candy my own lilac flowers to give it that extra lilac taste and take my cake decoration vision to the next level. How pretty is that, right? They are very easy to make and it is in the recipe below. 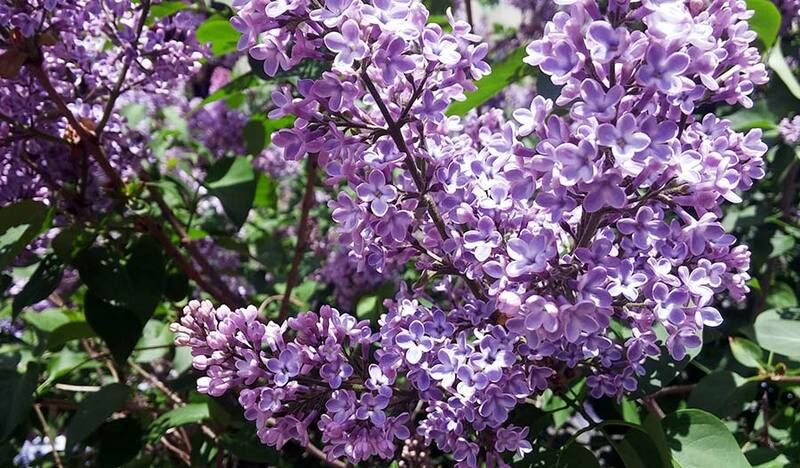 And yes, as long as your flowers are pesticide free, lilacs are edible. When candied they are actually a little addictive. 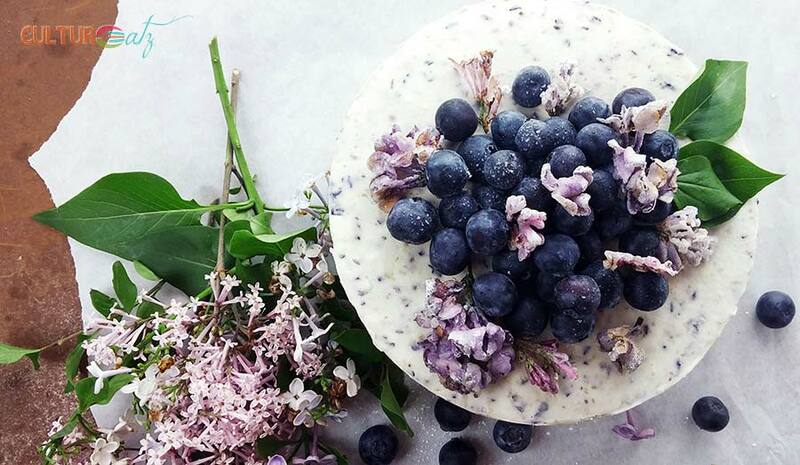 Building this Lilac Blueberry Cheesecake. Well of of the best part is that this cake is no bake! A great summer recipe. And there are 4 layers to it. The first is a buttery crust made with crushed granola. Second, we place half the filling in the pan. Next a layer of blueberries is evenly spread out. And finally we pulse in some blueberries to the remaining filling, gently spooned in, to create a two tone cheesecake. 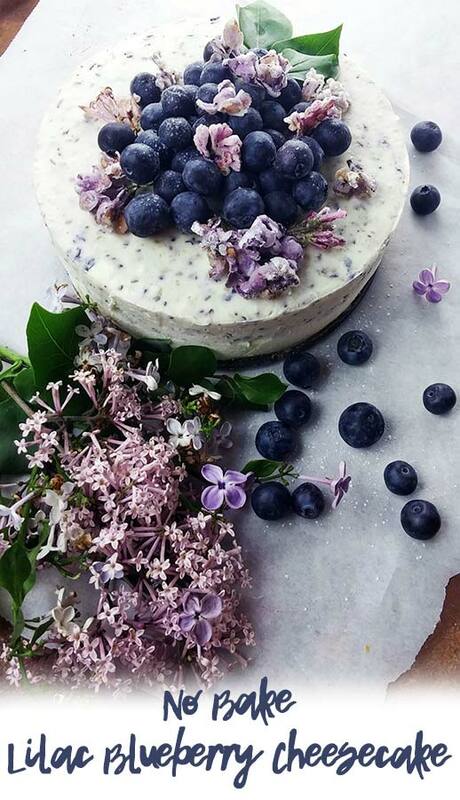 I cannot even tell you ho happy I am with the final result of this No Bake Lilac Blueberry Cheesecake. Even with three different form of lilac in the cake – extract, actual flowers, candied lilac -the amounts are subtle. The flavor is not overpowering at all, it is a perfect whisper. A bite, full with a mix of the unctuous cheesecake filling and the blueberries, make this cheesecake utterly sophisticated and sinful. Candied Lilacs: thin an egg white with a bit of water and beat well. Dip flowers in and shake excess off. Pour the sugar over the flowers with a spoon to cover completely. Leave to dry on a parchment paper for 12 to 24 hours. Crust: add butter, brown sugar, granola and salt to a food processor. Pulse until combined. Pour into a 6 inch springform pan, press down evenly with a spoon and refrigerate. Add gelatin to boiling water to soften and set aside. In the a food processor, mix condensed milk and lemon juice and pulse until a bit thickened. Add in the cream cheese, gelatin, lilac flowers and vodka, and the ricotta. Pulse until combined, about 1 minute. Pour half of the filling evenly over the crust in the cake pan. Sprinkle 1/2 cup of blueberries over the filling. Set aside. To the remaining filling add 1/2 cup of blueberries and pulse until blended. Pour the filling gently over the blueberries and spread evenly on the top. 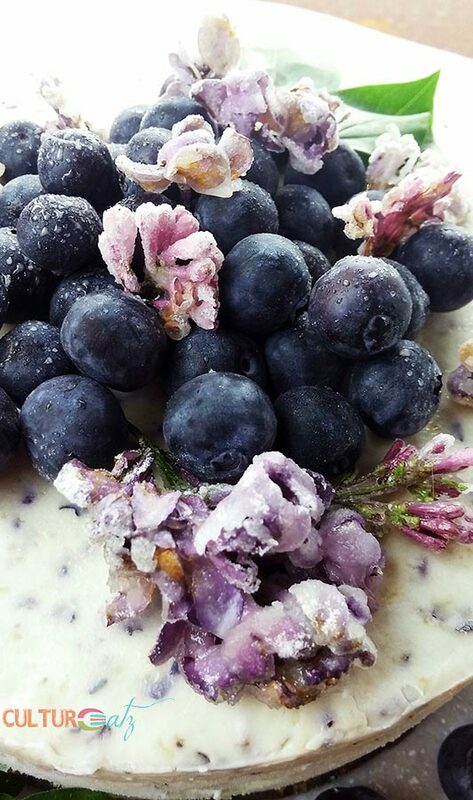 Refrigerate overnight and decorate with extra blueberries and candied lilacs if desired. Lilac Vodka: in a small jar pack some lilac flowers and cover with vodka. Shake the jar once a day for 2 weeks. Strain out the flowers. Congrats! Time flies.... Lilacs are my absolute favorite flower of all times and I love what you did with that inspiration! Thank you Debra and yes, where did the years go! Oh how fun you are my fellow lilac obsessed friend lol. OMG! What a milestone! It goes without saying that you are very good at what you do. Congratulations and here's to many many more milestones. OMG again What a stunning recipe to celebrate with. The cheesecake is absolutely gorgeous! Wow 10 years! Happy anniversary. I still have a few more years to reach that milestone. And what a perfect way to celebrate your anniversary, a perfect cheesecake! Thank you so much Raymund! OMG! That cake indeed looks incredible! :) I would love to try this out, but I don't think we get lilacs here in India. :( Best wishes on your 10th blog anniversary. 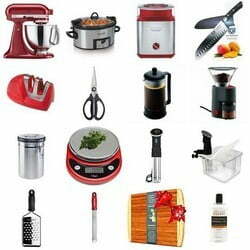 You seem to have achieved quite a lot in terms of culinary prowess in all these years! Kudos to you for that! 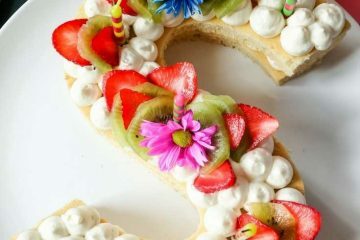 This is so pretty - happy blogaversary! WOW! A decade! What an exciting journey it has been for you! Beautiful post Evelyne and this cake is gorgeous. I am so so so intrigued by lilac in this cake. 10 years and what an beautiful range of pics to celebrate, just gorgeous lovely. Everything looks devinely yummousable. Congratulations on ten years! It's only been eight for me and so much has happened in that time, even though like you I do it as a hobby next to my day job! 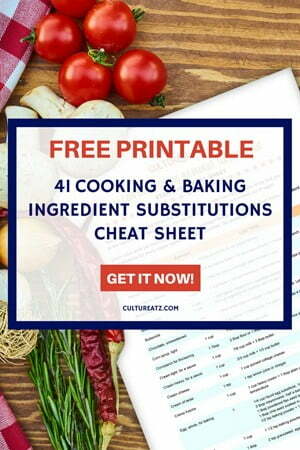 I love the recipes you post here, I think I found you at the perfect time just as you were returning to those more challenging and unusual recipes, as these are the ones that really appeal to me. This cheesecake is no exception, great way to celebrate your decade! Thank you so much Fiona! OMG yes it is so hot here I could not imagine turning on the oven! Congratulations Evelyne! My 10 year anniversary is next year! You are an old blogger too! The cheesecake looks fabulous! Thank you so much Katerina. Wow yours is coming up too, time flies by. WOW! and Double WOW! 10 years! That's fabulous! Congratulations! My how time flies when you're having fun. :) You did WHAT to the lilac blooms? Double WOW! Well, you really went all out with this celebration and what a great reason to go all out. The cheesecake looks incredible! Double thank you MJ :-) Yeah I don't know where the years went that is for sure. So glad you like the cheesecake (and yeah toss any edible flower in booze to get there flavor). Thank you so much Mardi! Never though the word pioneer would apply to me lol. We are very close in blogging years both. This looks soo yummy. What a great way to use up berries. And I love that it's no bake! My boyfriend would LOVE this. 10th BLOG ANNIVERSARY! OMG !!!! You almost have a TEENAGER ON YOUR HANDS!!!!! hahahahaahahahahahahah! OMG you are right in 3 years it will be a teen. What did I get myself into lol! HAHAHAHAHAHAHA why am I not surprised! I've never tried a blueberry cheesecake but my mouth is watering right now. Delicious recipe! Thank you Agness, it fruit to so all healthy right. AH thank you so much Liz, we have been following each other for a very long time indeed and I am so happy we do. You are a great source of inspiration as well. I think the idea of infusing lilacs came during a lilac high after too much sniffing lol. Glad I did. But would Bill go for it lol? Thank you so much Lorraine, it truly means a lot. This looks truly amazing. Happy blogaversary Evelyn. Girl, you have some skills! That recipe is so impressive. The cheesecake looks lovely, what a showpiece. Congrats on your 10th anniversary. That is super! Thank you so much Juliana for your most kind words, they mean the world to me.It is a pleasure to visit your blog every week and I value all your comments. So glad you like this cake, it is really wonderful. Congratulations on marking your 10-year anniversary! That is a major accomplishment to have nurtured and grown a project for a decade. Your goal to try a recipe from each country is a hefty commitment, but it should be a flavorful and educational journey that I look forward to following. I'd be happy to celebrate these goals and accomplishments with a slice of your lilac blueberry cheesecake. ;-) I love the purple flowers and scent of lilacs, and adding candied lilac is a nice touch. Thank you so much Erin, here is your slice ;-) It has been a long project and many more to come. I just go at it slowly, a piece at a time. A key to survival in the long term lol. 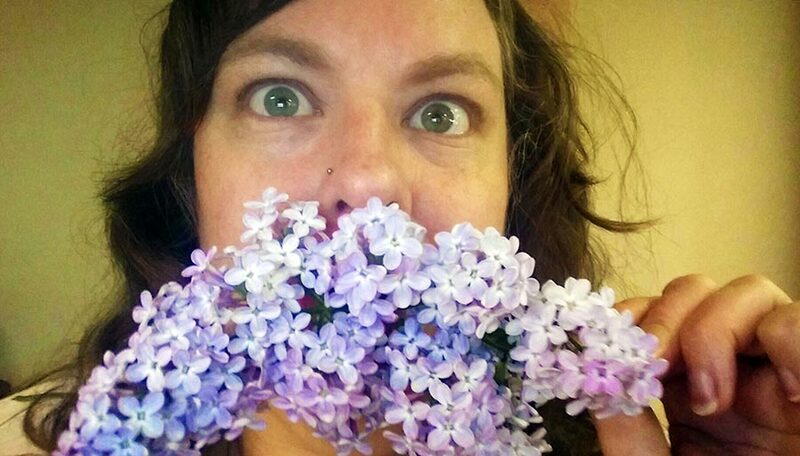 Who knew that lilac flowers were edible? Not me! I love them, though, and the fragrance is truly intoxicating, vodka or no vodka! I also am a blueberry freak. I eat them every day so this cheesecake is a winner in my book just looking at it! I would love to have this for my birthday dessert in August. Guess I'll have to make my own as I know this won't be on any menu! Happy Double Digits! Wow, that's forever in the blogging world. Congrats. And congrats on this recipe, too. This looks so terrific. Not to mention really pretty. Bet it tastes awesome! Thank you so much Angie, and thank you for your amazing support! The cheesecake looks so gorgeous with the candied lilac flowers and granola crust. Good job, Evelyne. I just made some propolis tinctures with water, alcohol and coconut oil...the whole kitchen smells too propolis!!! p.s Excellent photos! Oh wow that propolis tincture sounds amazing, I hope to see it on the blog soon? Thank you I am quite happy with this cake ... as everyone who has tasted it lol.